The title animation makes the dogs seem like they’ll be important. If you asked me who my favorite child actor at Disney was when I was growing up, I’d say Jodie Foster. Her hidden-treasure movie Candleshoe lodged in my brain and never left. But if for some reason you’d excluded Foster from the choices, I’d definitely give you a give you two answers: Kim Richards and Ike Eisenmann. 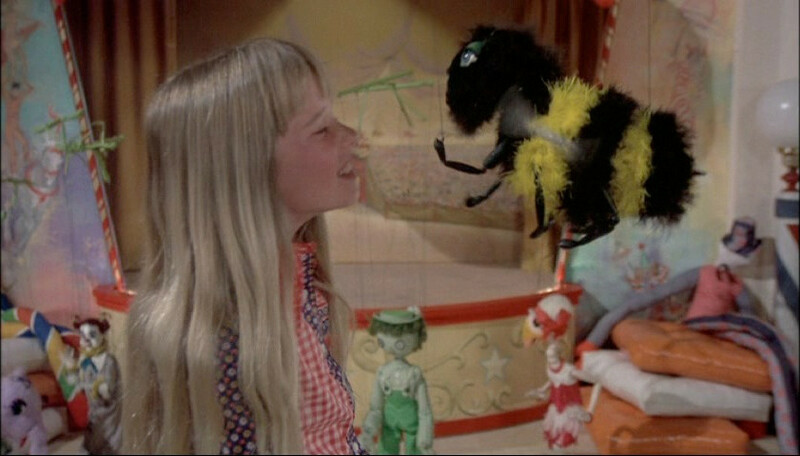 They seemed to be everywhere, and most importantly they were Tia and Tony Malone: the Witch Mountain kids. Escape to Witch Mountain picks up with Tia and Tony on their arrival at an orphanage (following the deaths of their foster parents, the Malones) and follows the siblings through their journey to Witch Mountain for answers about their past. Along the way they’ll explore their extraordinary powers, have some ice cream, outwit authorities, and teach Jason O’Day (Eddie Albert) to love again. There’s also a bear, because why not? 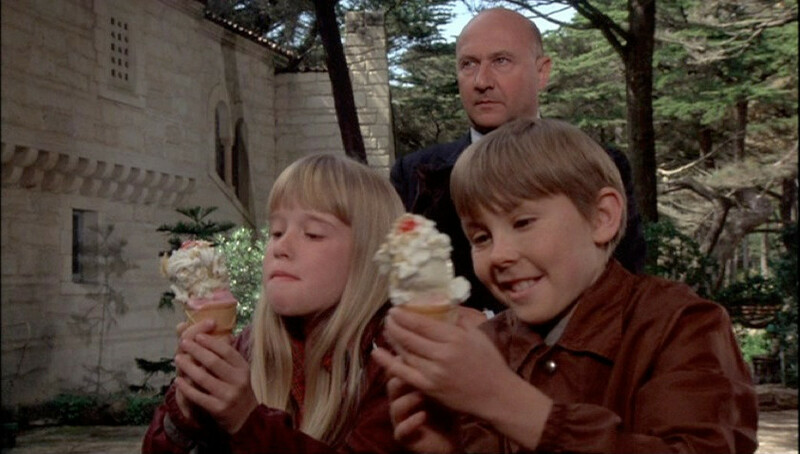 Donald Pleasence does not get ice cream. Looked at with adult eyes, Richards and Eisenmann stood out mostly by being at ease in front of the camera (or at least appearing to be). Their grins feel genuine, and while their line readings are sometimes a bit artificial they do a good job of trying to give their delivery the right emotion. Moreover, at this young age they looked like they could be brother and sister. By the end of the decade they’d done so often enough that they had a natural rapport. 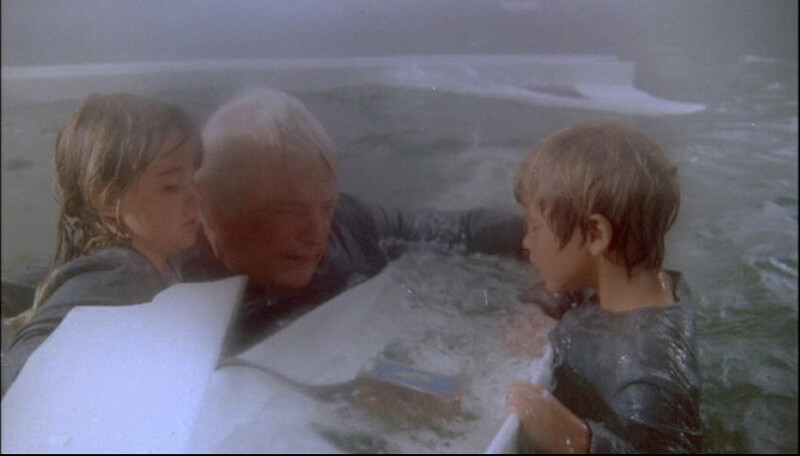 Richards does the majority of the heavy lifting for the pair here, as Tia is plagued increasingly with a nightmare about the two of them trying to stay afloat in the ocean after an accident. As time progresses she realizes that more were there, including their Uncle Bene (Denver Pyle). Tia remembers their Uncle Bene being at the accident. The title starts with “escape”, and that is not a lie. Millionaire Aristotle Bolt (Ray Milland) wants Tia and Tony to use their abilities to make him even wealthier. Tia had given Bolt’s employee Lucas Deranian (Donald Pleasence) a warning that had saved his life, and Bolt wants to turn that precognition to good use: locating underground resources and predicting markets. For the first stage of their adventure the children are taken to Bolt’s mansion under the ruse that Deranian is their uncle. This is my favorite part of the movie, as the kids go from elation at Bolt’s generosity to disgust at his greed. For the rest of the film they are indeed escaping, from the gilded cage that had been prepared for them. Tia dances with puppets in their room at Bolt’s mansion. 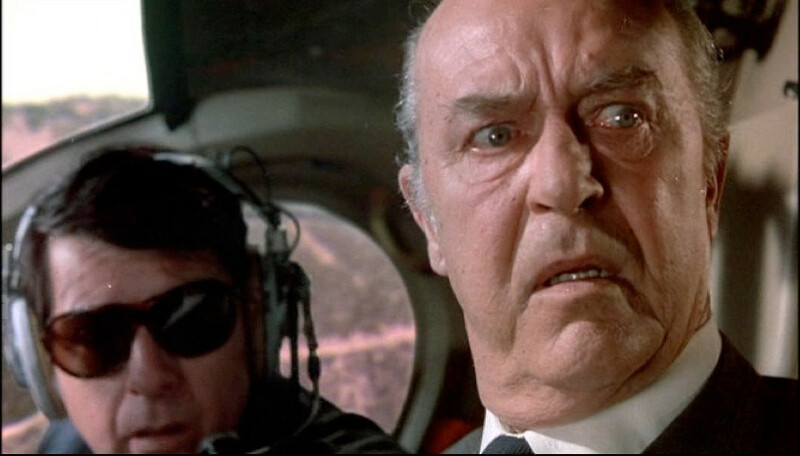 Ray Milland had already been playing horrid old men for some 5 years before taking on the role of Aristotle Bolt. This was most likely the very first time I saw him in anything, although it would be decades before I realized it. It’s a children’s movie, and the threats are undermined with humor to keep from being too frightening, so Milland is at his campiest as Bolt. He puffs with arrogance, blatantly patronizes the children, and he pulls some amazing double-takes and eye-goggles. It’s a delight to watch Milland’s bluster break over Pleasence’s reserved demeanor, unintentionally broadcasting that all of Bolt’s energy would come to nothing. It’s not the greatest Milland performance, but it is fun and memorable in its own way. Bolt sees the flying Winnebago. 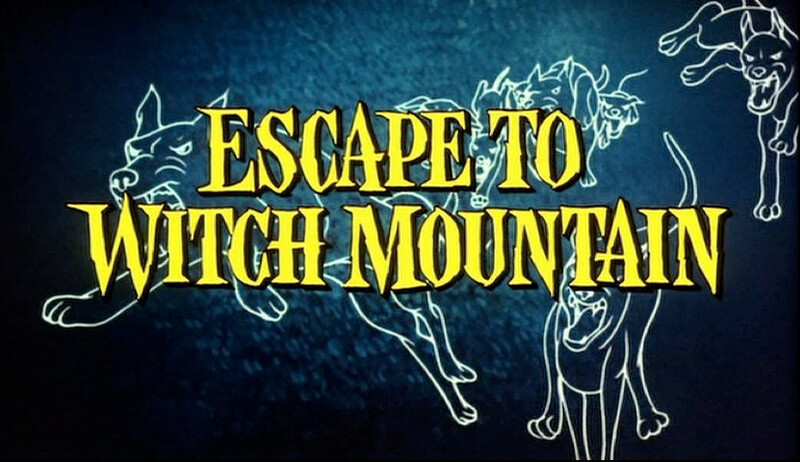 While Escape to Witch Mountain was important to me in my youth, I honestly hadn’t thought much about it as an adult. It wasn’t until noticing it in Milland’s CV that I decided to take another look at it, and I’m glad I did; some of my favorite actors, now and as a child, were in this weird little movie together. It felt a bit like coming home.